Talk of Impressionism and the name Monet or Renoir immediately top the list; Realism brings to mind Gustave Courbet's painting Bonjour; and Surrealism, well, only images from Salvador Dali will do. Having grown up with a small amount of artistic ability and the enjoyment such a pursuit brings, these names were comfortably familiar to me. When I began my education in astronomy 15 years ago, I was uninitiated regarding the world of Space Art and those who render it. Today, the term Space Art brings to my mind many of the more recent images and creators of this form. I've discovered that, unlike most other genres, space art has not been the sole province of one or two individuals influencing its style and form, but developed through the collaboration of many academic and professional institutions of science; a natural occurance perhaps, as it was they who at first had the "knowing and science of such things". Perhaps it is because I am a newer enthusiast to the genre. Be that as it may, today, when one speaks on the history of Space Art, the name Chesley Bonestell tops the list as the father of modern space art. Bonestell was born in 1888, in the city of San Francisco, California. Like many others before and after him, his interest in astronomy was aroused not from the academic field but from hands-on experience, viewing the moon and the planet Saturn in 1905 through the 12-inch telescope at the Lick Observatory in San Jose California. Inspired and excited, Bonestell created his first painting of what he had viewed through the observatory's telescope, a rendering which was unfortunately destroyed the following year in the large fire that resulted from the earthquake which rocked San Francisco and other cities in 1906. Though Bonestell's astronomical pursuits began early on, it would be his artistic and drawing abilities that would start his long career. He began his higher educational studies in architecture, at Columbia University in New York City, a discipline that he actually enjoyed, applying himself to the extent that he bacame a master at the art of perspective drawing. After three of years of study, Bonestell chose to leave the university without graduating, eventually returning to San Francisco where, finding himself well qualified, he obtained work as a designer for the well known architect Willis Polk. By 1916, Bonestell had moved on to other projects, obtaining a position as designer in collaboration with California landscape architecture Mark Daniels, lending his talents in the creation of the world-renowned 17-mile drive in Pebble Beach, California. It was during this period that his interests again turned towards the science of astronomy, applying his artistic talents in a variety of images depicting the surface of the Moon and the planet Mars. After visting Italy in 1925 the Bonestells returned to England but decided to return to New York in 1927 as a result of the employment opportunities afforded Bonestell fom the sudden growth in hi-rise building construction. There, Bonestell was again employed as a designer with several well known architectural firms but the sudden demise of the stock market in 1929 saw his return to the San Francisco area where he was employed creating illustrations depicting the various phases of construction on the Golden Gate Bridge. With the surrender of the Axis in 1945, World War Two came to a close, but in its wake it left a legacy of change: the atomic bomb, jet fighters, the United Nations, the Berlin Wall, the reshaping of Europe, television, baby boomers and the computer. It also brought an impetus for developement into a new age of technology that was soon to turn into a contest between two of the era's most powerful nations; a contest began in fear and enmity, developed out of the political agenda of the times to become one of the most strived for national goals ever  the "Age of Rockets" and the "Race for Space" had arrived. 1. Notes David A. Hardy in his article THE HISTORY OF ASTRONOMICAL ART AND THE IAAA (The Electronic Astrobiology Newsletter Volume 6, Number 31, 1 October 1999) "In 1874 a book was published in England entitled simply The Moon, by James Nasmyth and James Carpenter. 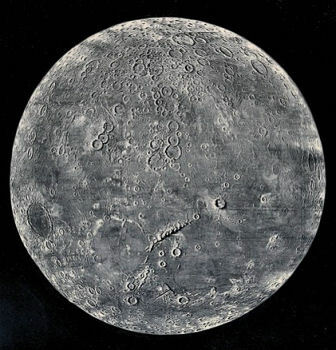 Nasmyth created accurate plaster models of the Moon's surface, lit them correctly and photographed them against a starry, black background as illustrations. These are probably the first examples of true space art." Willy Ley was not just an early expert and proponent of rocketry, but also an accomplished writer, having puiblished his first book in 1926, entitled Die Fahrt in den Weltraum ("Travel in Outer Space") and his second in 1928 entitled Die Möglichkeit der Weltraumfahrt (The Possibility of Interplanetary Travel) which become the inspiration for the movie Frau im Mond. Born in Berlin, Germany on October 2, 1906 Ley's education included studies in astronomy, physics, zoology, and paleontology at the University of Berlin, a degree in journalism from the University of Koenigsberg and an honorary Ph.D. awarded by the Adelphi University of New Jersey in 1960. It was at this time in 1944 that Chesley Bonestell was introduced to Willy Ley, their meeting coming as a result of Bonestell's publication of paintings he had submitted to Life magazine. From this point forward, space art would develope into a universe full of richly colored surfaces, mountainous terrains, landed space craft and crews who took leave of their ships in oxygen supplied, helmeted space suits to explore the worlds they had left the Earth to visit. * An earlier writing on this subject was published in 1931 by one of the lesser-known pioneers of spaceflight, David Lasser. His book, entitled The Conquest of Space, explained the basic concepts of rocketry and spaceflight. It was based on the best information available at the time and therefore some errors appear within the text. In 1930 Lasser founded the American Interplanetary Society (today's AIAA). Lasser passed away on May 5, 1996. The current publishing has a foreword by Sir Arthur C. Clarke. 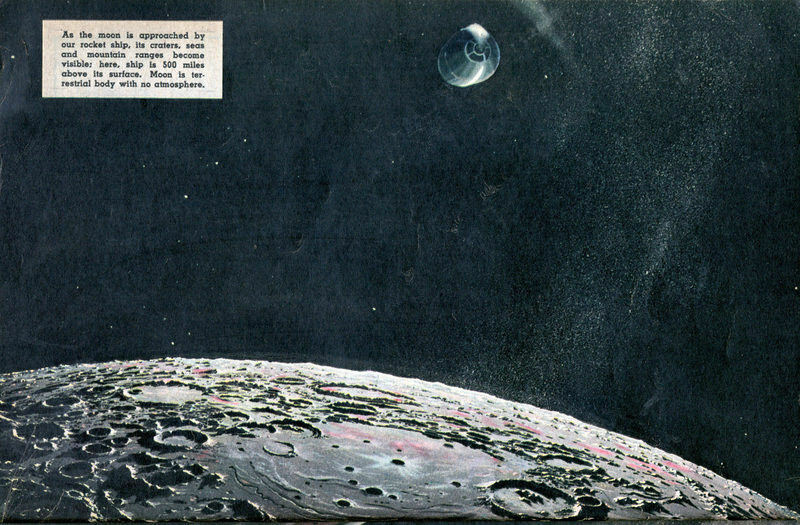 It has been often said that if not for the way in which Chesley Bonestell rendered his images of the lunar surface, that the public at large may not have been as anxious to go there. If so, then his art shares a place in history with a select but very small fraternity of artist; the last work of art to stir the public was perhaps Picasso's famous depiction of the German bombing of Guernica during the Spanish Civil War. One thing is for certain, many of those who became involved in space programs and rocketry, including many more who didn't, credit the images that Bonestell began to render and which Willy Ley wrote about, as their inspiration. 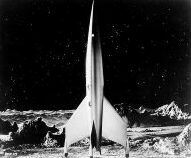 Seen on its approach is the Bonestell painted rocket ship, 500 miles above the lunar surface (Mechanix, page 74). 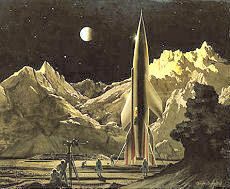 Between 1946 and 1949, Bonestell and Ley continued publicizing rocketry and space travel in various magazines like Scientific American, Coronet, Life and Pic. 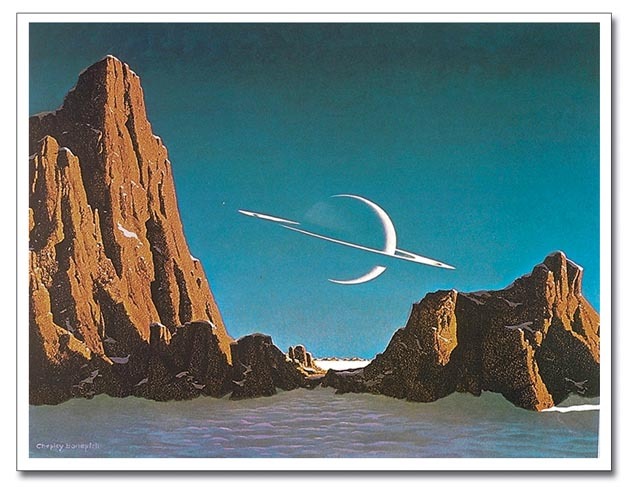 In 1948 Bonestell created what has since become known to collectors and aficionados as his most famous and influential stellar image ever, entitled Saturn from Titan and shown below. Image Courtesy Novaspace Galleries. Written beneath the front cover's image is the bold and promising message proclaiming the book to be "A preview of the greatest adventure awaiting mankind with text and pictures based on the latest scientific research" As the readers of this book were to discover, it was exactly that and a whole lot more. Seen at left is the front cover of The Conquest of Space as well as cover and end paper art. The second image is the book's iconic painting by Bonestell, showing the conception of lunar flight at that time, complete with survey crew. Setting the space ship against a backdrop of steep and jagged lunar montains, while incorrect, gave it a unique appeal of provocative imagination and inspiration. 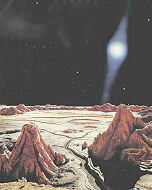 The third image depicts the baking surface of Mercury, one of the many planetary surfaces that Bonestell included in Conquest. Appearing at the end of Chapter 3 were scenes painted of Venus, Mars, Mars as seen from Deimos, Saturn from Japetus, Saturn from Titan, Saturn from Mimas and an imaginary planet of the double star Mira. 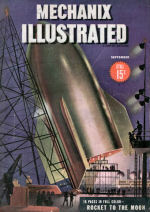 Many of the images included in Conquest had been previously released in various magazines articles such as Life's 1944 and 1946 issues. Above volume, The Conquest of Space from author's collection. Images are copyright © Bonestell Space Art. The impact of The Conquest of Space must be viewed in light of its goal and the influence that such a work had on the preceptions and desires of an age just awakening to the prospect that such a thing could even be possible, let alone close at hand [fn5]. That the lunar surface was actually an uninteresting vista of sand-dune like hills, powdery surface and smoothed rimmed craters misses the point  rockets blasting off towards space were not a common sight; there were no regular launchings of satellitecarrying Delta 4 or Atlas 5 rockets from Cape Canaveral and as such, they was little factual knowledge or concern regarding the current state of development or potential within the mainstream public. What Bonestell and Ley were attemping to do was to enlighten the public to the fact that rockets and space travel were no longer what if dreams or theorized possibilities kicked around a lunchroom table. Even as they wrote their book, rockets had already been modified, engineered and launched; and they had already reached space. There was a myriad of V-2 test firings and high altitude launchings at White Sands, including the first multistage rocket and V-2's equipped with the latest scientific equipment for upper atmospheric research by the NRL between 1946 and 1951 (Naval Research Laboratory). 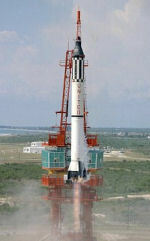 These alone contributed to the decisions which enlarged the White Sands testing grounds, built additional facilities, researched newer rocket designs and finally, led to the developement of what became the launching point for all subsequent vehicles  the facility at Cape Canaveral, Florida. By 1958 earth orbiting satellites were a fact and by 1961, men had flown into space. To these gentlemen and others, the furture of space travel had arrived and through the images of Bonestell, so too would the support and desire to get us there. Part Two of Art & Artists of the Universe continues with the collaboration of Chesley Bonestell, Dr. Wernher von Braun, Willy Ley and Fred Whipple for the famous Collier's magazine series of articles published between 19521954. We'll then follow the history of the art from the first successful manned space flights of 1961 to the Apollo 11 moon landing of 1969, concluding with STS-1, the first space shuttle mission of 1981. 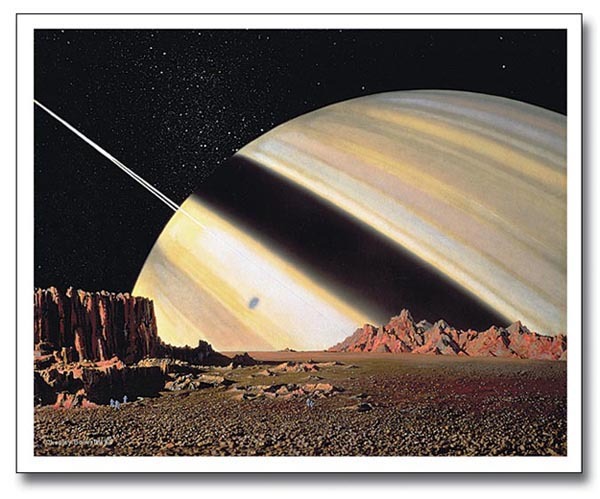 Part Three is a review of space art as it was presented in the media of pulp science fiction magazines, a form popularized by many artists and writers from 19301950. We'll explore both the art and artists who frequently contributed to such publications as Astounding Science Fiction/Analog, Startling Stories, Satellite Science Fiction and Galaxy Science Fiction. The series concludes with a look at the genre's current form and style, sampling the universe as rendered by today's artists through the format of paintings and computer imagery. 2. An interesting histroical aside arises from the movie Frau im Mond regarding its use of the "countdown". As the Moon rocket neared the moment of launch, a loudspeaker announced: "Five...four...three...two...one...zero...FIRE!" Though used for its dramatic effect, Lang had popularized the "countdown" still in use today.  Science Fiction Filmsite University of Michigan Fantasy and Science Fiction Web Site. 3. Membership within the VfR dropped dramatically in 1932 as German police began objecting to rocket tests within the Berlin city limits. This was coupled with a fear of Adolf Hitler, who began restricting the activities of organizations, like VfR, that had significant ties to the international community. Facing total elimination, VfR made pleas to the German Army to aid in the continuation of rocket testing. In the summer of 1932, the German Army allowed VfR to launch a Repulsor-type rocket (named by Willy Ley) at an army proving ground at Kummersdorf; the upshot was that the club could continue under the aegis of the army or disband. The German Army did allowed Wernher von Braun to continue rocket experiments while working on his doctoral thesis in combustion phenomena, using the facilities at Kummersdorf. The VfR however, was forced to disband in the winter of 1933/1934 because the organization could not meet its financial obligations. 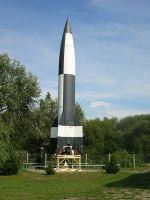 Rocketry experiments ceased at the Raketenflugplatz facility in January, 1934 and the area resumed operation as an ammunition dump. Upon the disbanding of VfR, all private rocket testing in Germany ceased. Willy Ley left Germany while Wernher von Braun officially began his work for the German Army at Kummersdorf. See Verein für Raumschiffahrt (VfR) The Internet Encyclopedia of Science, The Worlds of David Darling and Highlights in German Rocket Development from 1927  1945 from the NASA  Marshall Space Flight Center website. 4. 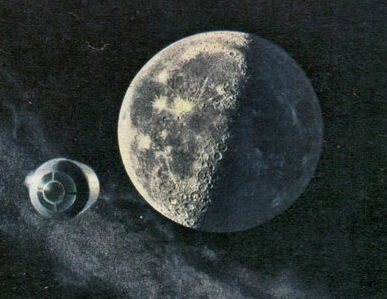 Amongst those on record as having been influenced or inspired by Bonestell's art were Carl Sagan (author), Arthur C. Clarke (author), Wernher von Braun (scientist-engineer who's own images were revised by Bonestell), George Pal (movie director), Robert A. Heinlein (author who turned Bonestell's name into a verb), Victor Stenger (professor and author) as well as many of the engineers and scientists of the early pre and post NASA era. Dalby, Richard Bayard, Emile-Antoine. In Robert Weinburg, A Biographical Dictionary of Science Fiction and Fantasy Artists (NY & Westport, CT: Greenwood Press, 1988) 47. Herman, Jan K. and Corbin, Brenda G. Trouvelot's Chromolithographs, article from the New York Library, presented by the Science, Industry and Business Library, 2001, 2009. Edan Milton Hughes Gallery biography of California Artist Howard Russell Butler, July 23, 2009. Also see Shades of Glory My whirlwind tour to the North Pole and back for 175 seconds of totality by Joe Rao, Natural History Magazine, October 2008, © 20082009 Natural History Magazine, Inc. All rights reserved. The Lucien Rudaux Memorial Gallery from the International Association of Astronomical Artists (IAAA), Copyright © 1998 - 2007. Biography reprinted with permission of the IAAA. Exploring the Unknown, Selected Documents in the History of the U.S. Civil Space Program Volume VII Human Spaceflight: Projects Mercury, Gemini, and Apollo Edited by John M. Logsdon with Roger D. Launius 2008, The NASA History Series, National Aeronautics and Space Administration, NASA History Division Office of External Relations Washington, DC 2008. Document NASA SP-2008-4407, in .pdf format. Rock Drawings Tanum Fossum Sweden Norway Scandinavia Astronomical Solution LexiLine List on the History of Civilization, revised March 11, 2004. 1054 Supernova Petrograph by Dan Greening, from the Chaco Canyon National Park web page. Galileo's Moon Drawings GALILEO'S OBSERVATIONS OF THE MOON © Tom Pope and Jim Mosher, July 2, 2009. The First Photo From Space In 1946, rocket-borne cameras gave us our first look at Earth from beyond the atmosphere. By Tony Reichhardt, Air & Space Magazine, November 01, 2006. Article regarding the V-2 projects at White Sands and the first images taken of the earth from a rocket in space.